The Kiselmanfest took place at Uppsala University in May 2006, on the occasion of Christer Kiselman's retirement. 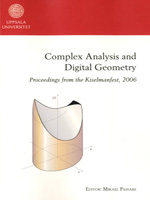 It brought together a large number of prominent scientists from around the world, representing the principal mathematical fields in which Chister Kiselman has been active: Complex Analysis and Digital Geometry. Several institutions, including Uppsala University, the Wenner-Gren Center Foundation, Gustaf Sigurd Magnuson's Fund, the Swedish Science Council (VR), and the City of Uppsala, provided financial support for the event. The present volume contains eighteen original scientific papers contributed by the conference speakers and their coauthors, and also an exstensive account of the mathematical achievements of Christer Kiselman. In addition, a number of photos taken during the conference have been included.